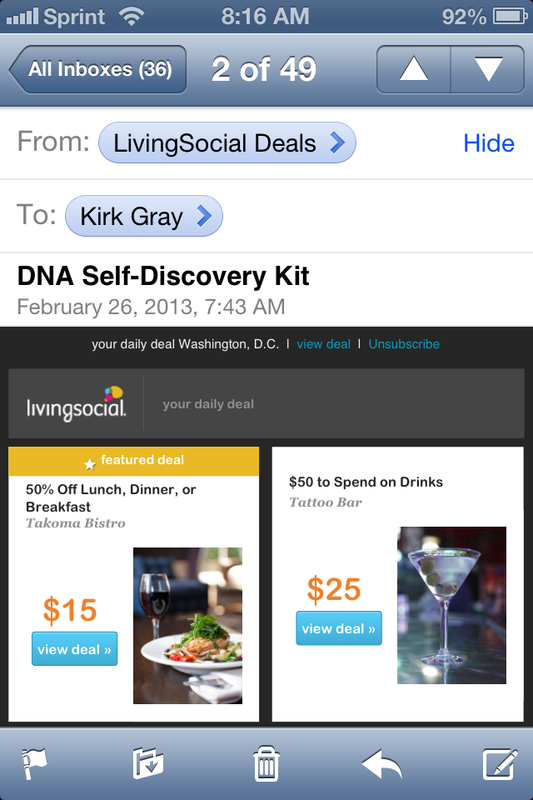 the subject line is "dna self-discovery kit", and is from livingsocial deals, and while the graphic only shows the two top deals (it's a screen shot from my iphone) trust me on this one, there was nothing about dna self-discovery kits included in this communication. the moral here is to check the content and to make sure the subject line has something to do with that content. i'll be honest, we've all done this. i was accused of this myself a long time ago, when i worked for a company where one of our weekly newsletters was just a bunch of links in a column, and no lie was more than two pages long, and one of the stories was really important but was buried in the link list about half-way down - or at the very least "below the fold". we actually had some people write back in to say that the subject line was misleading and a ploy to get people to open the communication, and that the article wasn't there. when in actuality it was, and these readers actually didn't scroll down the list of articles. i even had to point out to my boss and her boss that the article was there, and these were the people who were supposed to test the email and stuff! all of these possible answers can have consequences to server reputation and your scores. the first cause, which i know i am not signed up for this list twice or in multiple locations, can impact deliverability because the isp sees that you are not keeping up with your database - you aren't cleaning and deduping it, and they can start to think that if you aren't doing that, you aren't processing unsubs in accordance with can-spam requirements. if you have enough of these you'll eventually start to fall into the spam folder and your message or deal won't be seen by your subscribers. using a service to measure your deliverability will help with picking this up quickly so that you can act to fix it. 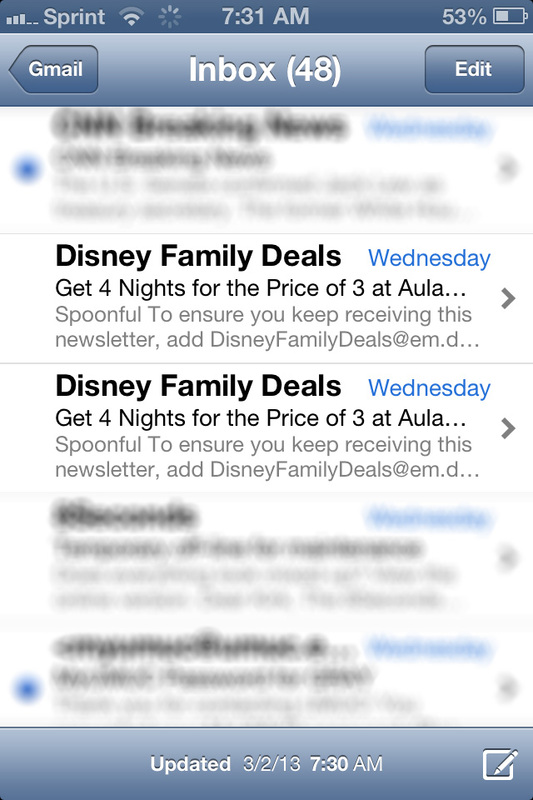 with the second one, either the email person sent it twice or the tool did. i know with the tool that i use this is a real possibility especially if you have multiple emails that you are setting up to send that day. with my tool i have to build the interaction, then hit send... if i build multiple interactions and then go back in to send them, the tool will rearrange the line-up, so it's very easy to send the same interaction twice. to remedy this, i build the interactions and then i move all of those interactions into a program, and then hit send on the program. it's an extra step but it helps to reduce the possibility of a duplicate send. if the tool does it, there are multiple reasons why this could happen, especially with web based sending tools - the quality of your internet connection is one that comes to mind. if you hit send, and the internet times out, it could look as if the send never happened, so the email person hits send again. this is where having patience and yourself included in all lists can help. if you seed yourself into the list, then if you get it after you hit send, you'll know not to hit send again. multiple sends of the same content to the same lists can impact your sender score and reputation because the ip sees this as a spamming practice or that your infrastructure is corrupted. a single instance of this isn't going to have that big of an impact but multiple occurrences will have an effect on your scores. and finally, if the isp routes the message twice, there isn't anything you can do about this. it doesn't happen often but it does happen. and even though it's their fault, it will impact your scores for the same reasons - they think you have multiple sends of the same content, multiple subscribers to your lists and so forth. using a service like returnpath and understanding deliverability will help you argue with the isps to get back into the inbox. but the moral of this is that you should really understand deliverability and how your sends impact your sender scores. in addition to this requirement, you should really be employing best practices for your database - remove duplicates, process your unsubscribes and make sure your infrastructure is performing like a well oiled machine.